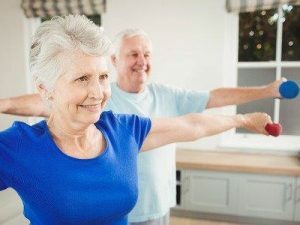 Here are more reasons for older adults to strength train based on a study from the University of California, Los Angeles, that indicates a new link between improving muscle mass and longevity. Muscle mass can be a critical component to longer life. Not only does muscle mass contribute to a healthy, balanced system, it can also help if you should fall. Do you have the power in your lower body, upper body and core to easily pull yourself up? Building muscle and strength can also assist with your balance and can relieve pain. In an American Journal of Medicine study which examined mortality rates (of all causes) among 3,000 participants, when muscle mass was measured, it was discovered in men 55 and older, and women 65 and older, that total mortality was significantly lower in those who did not lift weights. If you want to start a program of strength/resistance training, it’s best to begin with a thorough health history evaluation. It’s important to know your current medical condition, medications and if there are any planned surgeries. Also coming into play are conditions such as arthritis, diabetes, hypertension, cardiovascular disease and Parkinson’s disease. Once you have an overall health benchmark, you can then assess your fitness objectives. Are your goals realistic for you today based on your age and health? In the past perhaps you lifted barbells over your head for exercise. As we age, we may not need to do such strenuous movements. Exercises can be modified to the individual’s abilities and increased as practiced to continue to build muscle mass. Are you willing to learn something new that will make you feel as viable? In my opinion, sitting on a machine, when you may already be sitting a lot during the day, is not ideal. You can learn other ways to improve your strength without having all your body weight resting on equipment. To obtain muscle mass, check out our January 2018 video, “The Importance of Maintaining and Increasing Muscle Mass” or you might try floor exercises, like the ones I demonstrate in this Exercise Snack Video, or you might use resistance bands rather than weights. Whether individual training or group fitness is right for you, do your research and stick with your plan—including muscle mass building. For more tips and fun ways to be more active, reduce the pain associated with or injury, increase your balance, or building strength, please contact us. You can also refer to our FAQ page aka Questions and Answers, follow us on Facebook or check out our website at www.lorimichielfitness for other important fitness information, email us or simply call us at 818-620-1442 for a consultation.